The Italian-born artist Luigi Lucioni found great success in the U.S., where his still life and rural Americana paintings garnered early attention. The Metropolitan Museum of Art purchased a painting by Lucioni when he was just 30 years old. In the March 9, 1952 New York Times, Macy’s advertised an upcoming meet-and-greet with Lucioni in tandem with the manager of its decorating department. American Splendor was to cost $2.24 per yard. 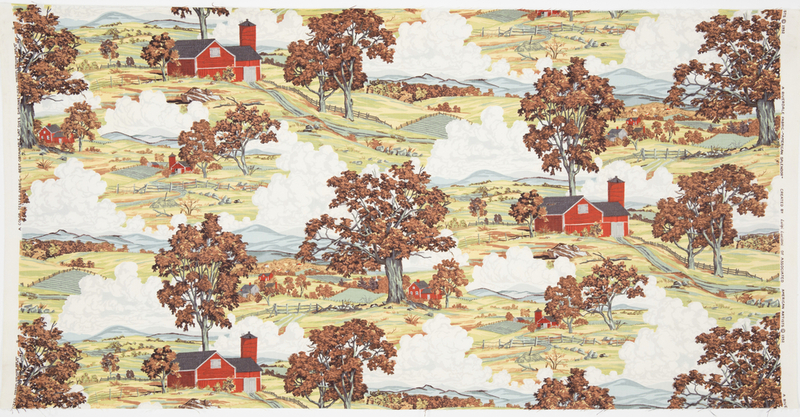 (1) Gail Windisch, Sylvan Cole Jr., and Karen J. Herbaugh, Art for Every Home: Associated American Artists, 1934-2000 (Manhattan: Marianna Kistler Beach Museum, Kansas State University, 2016): 52. This object was donated by American Textile History Museum. It is credited American Textile History Museum Collection.